Dracula online slots game | Powered by Net Entertainment. The Dracula video slot machine has a grand total of 40 paylines. Even in this modern day and age, with the demand for huge levels of immediate action this is a relatively high amount of paylines and hence winning opportunities. The next crucial factor in describing this game is for readers to understand that this is a game running on the NetEnt software platform. NetEnt games are graphically rich and highly functional in nature with numerous well-known branded images and themes uses to great effect. The theme of this Dracula™ slots game, quite expectedly given the trademark addition, features Bram Stokers’ famous vampire. All the symbols on the reels are associated with characters who are part of the Count Dracula story. The slots game contains regular Wild symbols, as well as the improved option of stacked Wild symbols. The game is available at all NetEnt casinos, and has demonstrated significant popularity. The Dracula™ slots game is based on the original story, and hence the horror movies that were inspired by it too. Created in an agreement with Universal Studios, as owners of the trademark, this slots game also has been prepared for the mobile market. 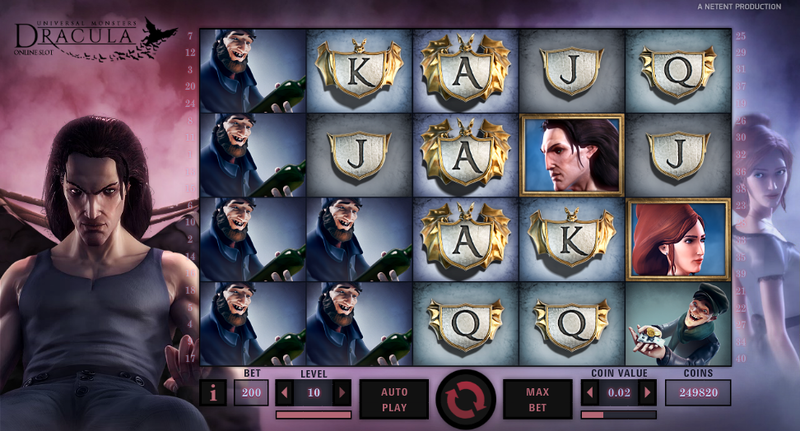 Dracula slots game has numerous special features that make the game unique. There is a Free Spins game, a Bat feature, stacked reel symbols and a Wild symbol with both regular and stacked aspects. NetEnt have used their graphics skills to create an eerie atmosphere in terms of theme development. The Bat feature is triggered at random during the game. When this happens, Bats suddenly flutter across the screen, gather together in a swarm before becoming one of the symbols, even the Wild symbol can be chosen. The Free Spins feature is triggered by the stacked Dracula symbol appearing on the second reel in conjunction with the stacked Lady symbol landing on the fourth reel. For this occurrence players are awarded ten free spins. The Free Spins round contains a flock of bats that descend on the reels, changing symbols randomly. This helps the player significantly. A stacked Wild symbol appearing gives two additional free spins. The top jackpot is but 400 coins. The return to player percentage is 96.6%, and sets the Dracula real slots NZ game as a fairly low variance slot. The coin denomination range is from 0.20 coins to 200 coins, and the payout rate is a comparatively high 96.6%. In Dracula video slot machine the Stacked Dracula symbol and the Stacked Girl symbol are the activators of the two bonus games that are available. In addition there is a recognisable Wild symbol, which behave in the standard way wilds do and substitutes for any other symbol in creating a winning combination. The stacked symbols can also come into play during the free spins bonus round. Watch for their appearance on the middle reel. The Free Spins bonus round is triggered by the Stacked Dracula reel symbol appearing on reel 2, with a concomitant appearance of the Stacked Girl symbol on reel 4. The other bonus feature, the Bat feature, is generated randomly. Thanks to the high pay out rate, players will find these bonus games regularly appearing, innovative to play and moderately lucrative.